"An enchanting urban fantasy middle-grade debut―the first book in a trilogy―set in a magical hotel full of secrets. Orphan Elizabeth Somers’s malevolent aunt and uncle ship her off to the ominous Winterhouse Hotel, owned by the peculiar Norbridge Falls. Upon arrival, Elizabeth quickly discovers that Winterhouse has many charms―most notably its massive library. It’s not long before she locates a magical book of puzzles that will unlock a mystery involving Norbridge and his sinister family. But the deeper she delves into the hotel’s secrets, the more Elizabeth starts to realize that she is somehow connected to Winterhouse. As fate would have it, Elizabeth is the only person who can break the hotel’s curse and solve the mystery. But will it be at the cost of losing the people she has come to care for, and even Winterhouse itself? Mystery, adventure, and beautiful writing combine in this exciting debut richly set in a hotel full of secrets." It seemed like it was time to do another mini grade review, so here we are! LIKES: I had a blast reading Winterhouse. 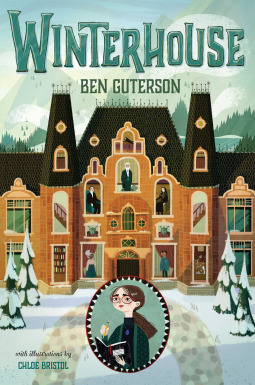 The story takes place in a friendly hotel that ends up being full of clever quirks and surprises and that encompasses everything I love in a middle grade mystery adventure. This book also loves puzzles and riddles, which are all set up in a way that allows the reader to engage and attempt to solve them along with the main characters. The setting is wintry and perfectly cozy, complete with a beautiful, expansive library open to all guests. There are daily activities at the hotel for guests to partake in and all meals are served at set times so that everyone at the hotel can come together and get to know one another. I found Elizabeth Somers to be a very charismatic and relatable protagonist, one that I feel people of all ages can relate to in different ways. She's very independent, which stands out for someone as young as she is, and I would say that a lot of it is due to the adversity that she has faced so far in life. I also loved the small call outs to some of her favorite books, such as Anne of Green Gables and The Mysterious Benedict Society--I thought that was a really fun and clever way to include other great middle grade books. There is a wide supporting cast of characters, from the friendly hotel owner, Norbridge Falls, to Elizabeth's new friend, Freddy, and to the mysterious and slightly creepy Marcus and Selena. All of these characters work together to create an atmosphere full of surprises and intrigue. I particularly loved some of the side characters that remained minor, but that still played an important role and provided some strong personality and excitement, such as the two men that work on the same enormous puzzle every time they come, slowly but surely hoping to complete it one day. DISLIKES: The 'villain' characters were really well drawn, though I would have loved to have a little more in the way of backstory or development to better understand them. I also had a few issues regarding Elizabeth and Freddy's friendship, namely due to how Elizabeth treated him at times, but I think this was meant to show that even Elizabeth has faults and can get caught up in different things. I also found it a little predictable at times, but I don't entirely fault the author for that because I'm quite a bit older than the intended audience, so I am sure that they would not find it as predictable. Overall, I've given Winterhouse four stars! If you're looking for a cozy yet exciting middle grade with a cast of unique and quirky characters, then definitely check this book out.